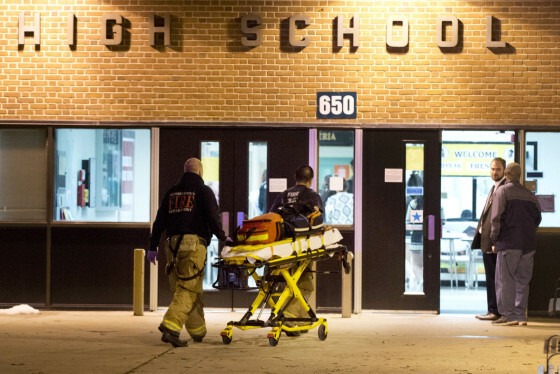 WASHINGTON — Maryland’s Frederick High School and West Frederick Middle School are closed Thursday after two teenagers were shot Wednesday evening on the schools’ shared campus while a basketball game went on inside the high school. The shooting, which occurred at about 8 p.m. outside the high school located at 650 Carroll Parkway in Frederick, sent game watchers running for cover as frantic parents rushed to the scene to make sure their children were OK. The shooting happened outside the high school while a junior-varsity basketball game against rival Governor Thomas Johnson High was going on inside the gym. 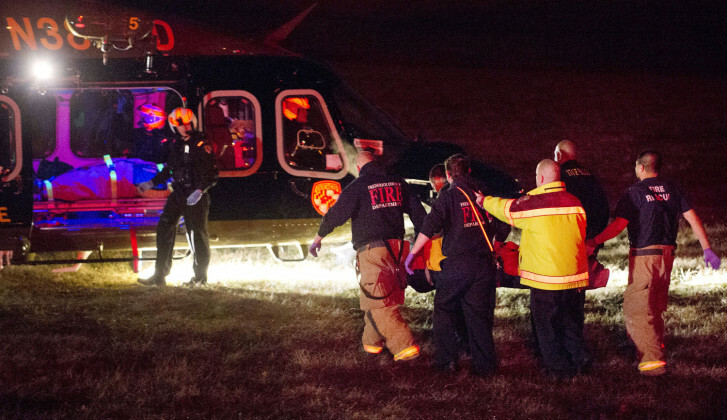 The two teen boys — both Frederick County Public School students — were flown to a hospital in Baltimore. One student is 14 years old and the other is 15, Denise Pouget, the Frederick County fire chief, said to The Washington Post. One was shot in a leg, and the other was hit in the back, Pouget told The Post. A Frederick County Fire Department spokesperson said originally that the teens suffered non-life-threatening injuries, but the police haven’t given any information on their conditions. No other injuries were reported and Frederick County Public Schools said all other staff members and students who were at the school were safe and accounted for. The police have no information on a suspect or suspects yet, and that they don’t know whether they’re looking for one shooter or more. Also, police don’t know whether the shooting was related to the game. Frederick County Public Schools Spokesman Michael Doerrer says the shooting won’t define the school system. The school systems is working with police, who are at the school’s campus Thursday morning as the investigation continues. “We are working closely with our law enforcement partners, carefully following the course of the investigation, and we look forward to sharing as much information as we can with the community,” Doerrer says. Frederick Mayor Randy McClement said the city’s resources are behind the investigation, and thanked local law enforcement for their response. Officers took about 200 people who were at the game into the school cafeteria, secured the building and questioned witnesses, police Capt. Richard Hetherington said. He added that the students began to be released to their parents at a nearby bowling alley at about 10:30 p.m.
Tanika Mayweather, whose 15-year-old son Lawrence was playing in the basketball game, said she found relief in knowing her son was safe. She said she’s not going to let her son play basketball for the school anymore. “We’ll have our basketball games out in the park,” she said. Sean Noah, 16, attends another high school but was in the building for swimming practice. He said he didn’t hear any shots. Afterward, he was kept inside for about 45 minutes. Frederick High School and West Frederick Middle School — which share the same campus — are closed Thursday, but staff should report and work normal hours. All other Frederick County Public Schools are open. Counseling services will be available for students and staff at the schools. WTOP’s Nick Iannelli and the Associated Press contributed to this report.